Well here it is, "The Great Storm Wardens Project." We have gotten so much out of this hobby and our blogs that we decided to give back a bit and work together on something awesome, and raise money for charity. The end result will be an incredible painted army going to one of you, the WINNER of this drawing. 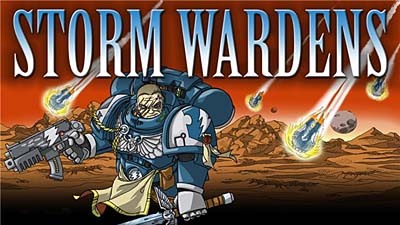 The Storm Wardens are a new Space Marine chapter from the yet to be released Death Watch RPG. Together with Games Workshop, Fantasy Flight Games (Horus Heresy, Wings of War) has been developing the game which will be released this summer. We approached the folks designing the Death Watch game while planning this project, and told them we were thinking of building a Storm Wardens army, and they loved the idea. They have been working with us in getting the look of the army just right and giving us some great unreleased fluff and imagery. 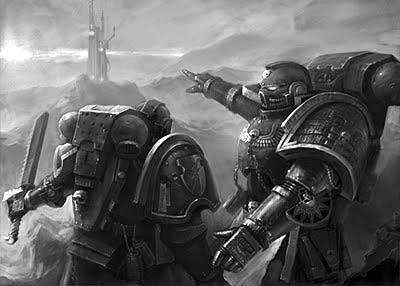 We are going to build a complete Storm Wardens Space Marine army with a decked out HQ, Marines, Veterans, Scouts, Terminators, and a bunch of vehicles, a massive army that any commander would be proud to field. You will be able to see the army units come together and follow the army build progress through links to all the builders blogs on our "Storm Wardens" mini blog roll. Who will be working on the army? and last but not least, your's truly. Along with the blogger build team, we are going after some related hobby retailers to give up some loot to add to the army prize. Secret Weapon Miniatures is donating all the custom bases, and Chessex has already sent us the custom dice. Well, you can give money to the cause. You can give to the fund at the top right of this page or any of the other participating bloggers, using PayPal or a credit card. Each dollar will also enter you in the free army grand prize drawing, the more you give, the better your chance of winning, and more money we can give to charity. We will draw the winner in mid July. What if I don't have any money, but I still want to help? Dig around under the couch cushions or under the seat of your car, put on some dark sunglasses and sell pencils out of a cup on the street corner, or even sell some extra Warhammer minis on Ebay, then use that cash for a donation. You can also help by linking to this project in your blog, telling your friends and other gamers, mention it at your gaming club or even posting about it in your favorite forums, this will help us get the most exposure we can, so we can raise more money for charity. If you have a small business (or know someone who does) that might have a product to donate that would be great to add to this army, contact us about a feature during the build. Why should I help out? If you have ever read something on our blogs that you thought was cool, gave you a good idea, showed you how to do something better, downloaded a free drop pod template, used the Barter Bucket, or perhaps you even got something from us for free and you are feeling a bit guilty about it.... well, now is your chance to give something back, pay it forward, return a good turn.... well you know. Oh yeah, and you could end up with an entire finished army, by giving $1 to the Storm Wardens Project. The money will be donated to Doctors Without Borders, and actually help people. We chose Doctors without Borders because their cause is a global pursuit to help people in need, where ever help is needed most, and they have a good track record with getting the $ where it does the most good. So there you have it. I hope you are all as exited about this as we are, its been tough keeping it a secret. So.......who wants a new army? I can't find your "raffle drawing at the top right of this page", but I was able to use the one at Stanta Cruz. Brilliant idea and I hope there will be a lot of participation. Wow - that's spectacular, Ron! And what a line-up: a true supergoup of the blossoming blogosphere! Excellent organization to be supporting... I've known a few classmates that accompanied them on trips to africa and south america, and they always had great stories that gave me new hope for the human condition. Klaus: Raffle drawing info is posted now, I didn't want to jump the gun with the rest of the guys. I'm getting my stuff together this week, so keep an eye out... there will be lots more posts over the next month. Very cool. Looking forward to seeing this come together. Super awesome, and an excellent choice of charity, as well! That is truly cool - and what a lineup! I doubt anyone reads my blog that doesn't already read yours but for what its worth I'll get some material up on my blog later today. I love this kind of initiative; way to go gents. I had to go to the Santa Cruz site as well. This is an excellent method for collecting charitable donations. I can feed my warhammer addiction while helping others! Woohoo! Love the idea and will anxiously await the unfolding of this project. Will the blogroll be on this page or somewhere else? Also, would you be able to post the HTML, etc. for the Storm Warden project so we can easily link it on our blogs? Awesome! Great charity, I will donate as well. Props to you guys for doing this. Great idea. I'm no company, but would have loved to contribute with some part of the army. Awesome idea, count me in! Holy Crap, the last day for donations is my birthday. Cool! I'm looking forward for your updates.